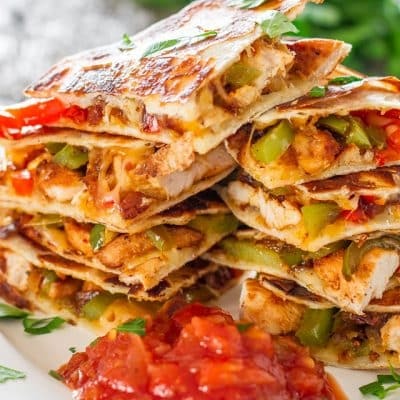 Chicken Fajita Quesadillas – sautéed onions, red and green peppers, perfectly seasoned chicken breast, melted cheese, between two tortillas. Simply yummy. Ah Tex-Mex! I love Tex-Mex flavors. 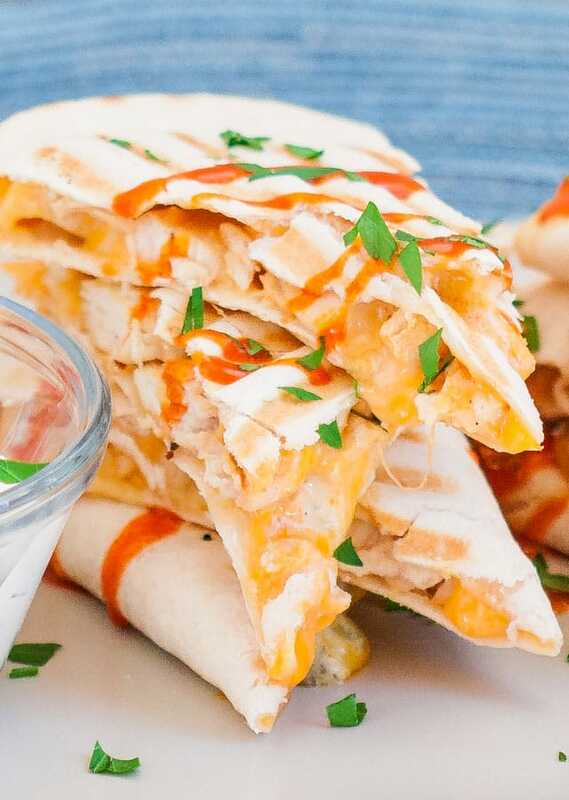 Especially when it’s in the form of a quesadilla. There’s this restaurant right next to where I work and whenever we go there for lunch I always order quesadillas. 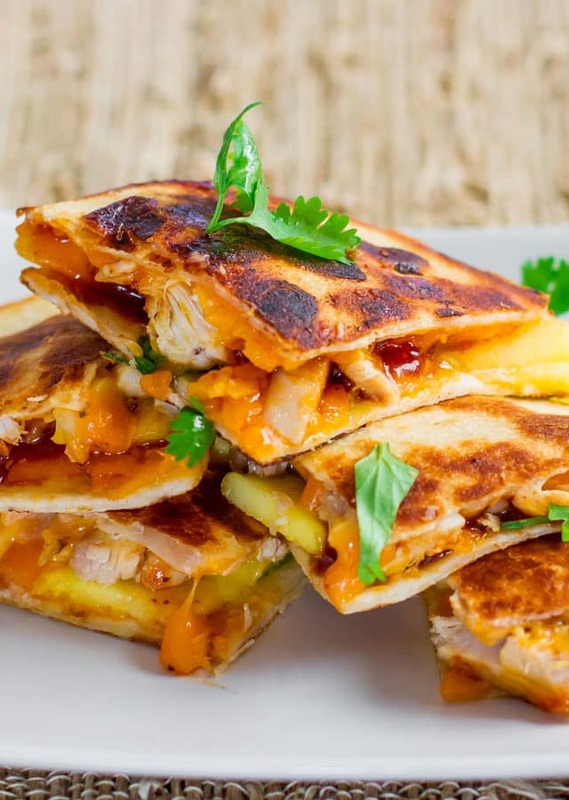 I just think you can’t go wrong with quesadillas. It’s like a sandwich but better. 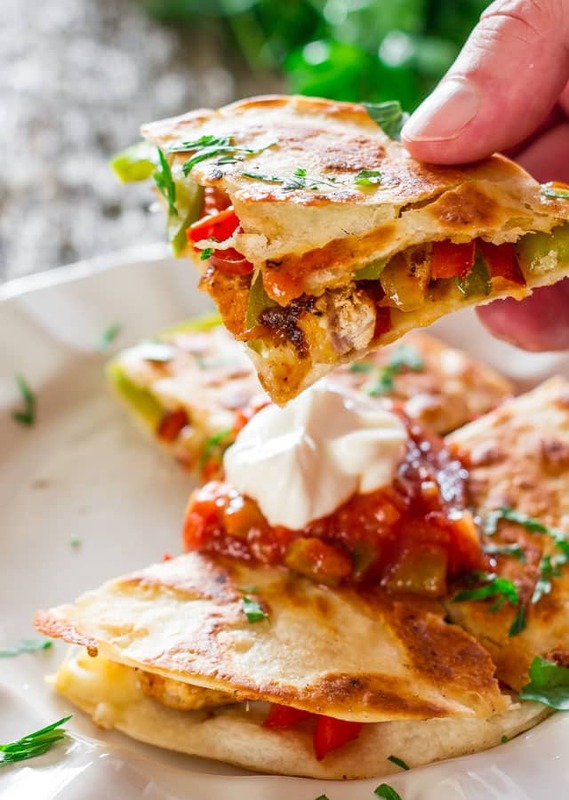 But I also love to make quesadillas at home sometimes on weekends, because they’re so easy to make and hubs simply loves loves quesadillas. Actually he loves anything that’s between two pieces of tortillas or bread. He’s a simple man to please. 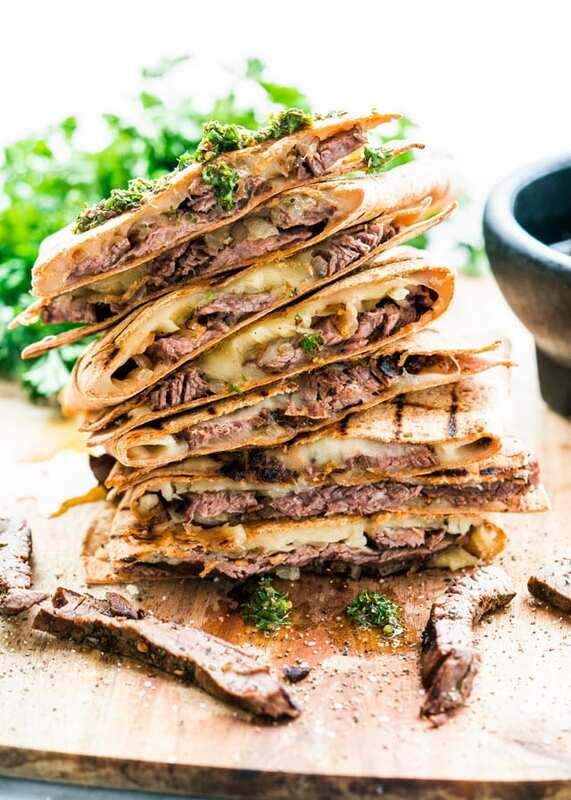 I, for one, love anything with melted cheese on it. I don’t care what, just put some cheese on it and melt it and I will eat it. 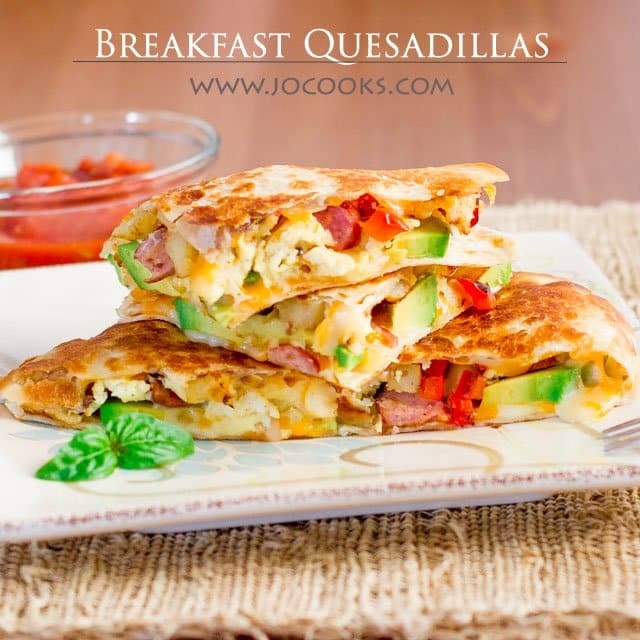 But these quesadillas are like this. 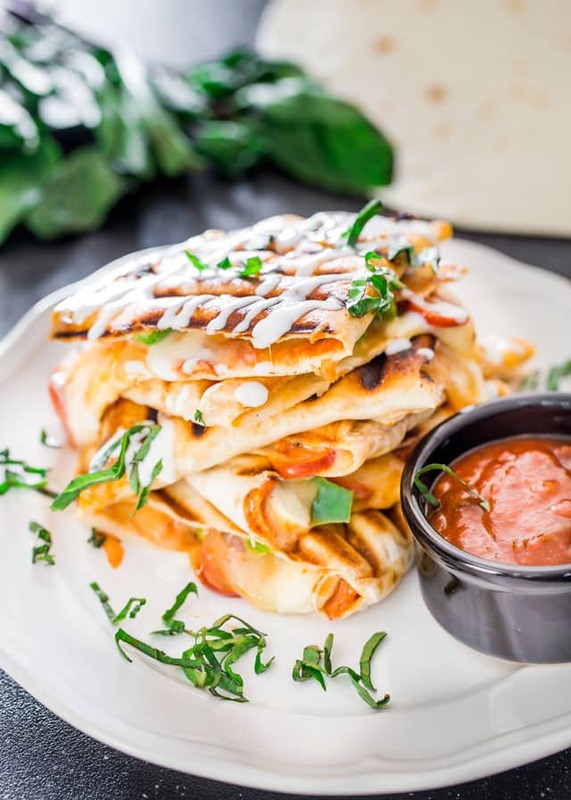 Sauteed onions and green and red peppers, chicken breast, plus some or lots of Tex-Mex seasoning, topped with loads of Tex-Mex cheese, place these yummies in between a couple tortillas and you’ve got L.O.V.E. It’s as simple as that, my friends, my webbie peeps. 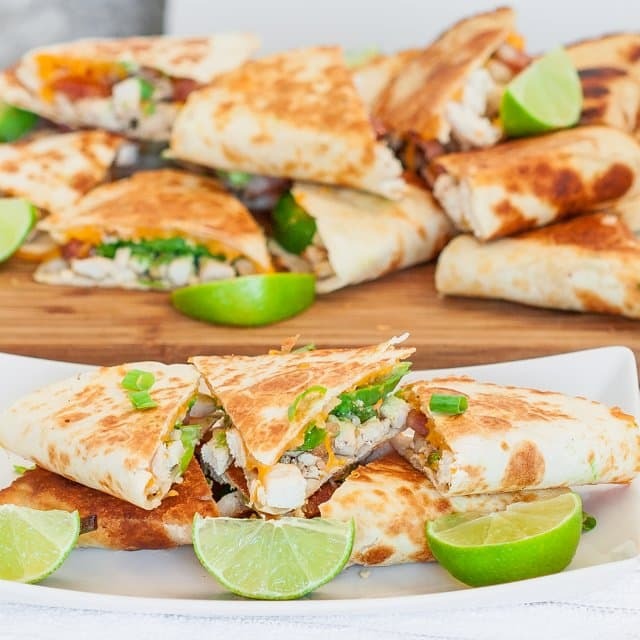 Can I just say that we inhaled these quesadillas! Hubs could barely wait for me to finish the pictures, because he was trying his hardest with his Vulcan mind meld to will me to feed him. Well you can’t blame the guy. When he’s hungry, he’s hungry. And when it’s something he loves, well you better stay out of his way. 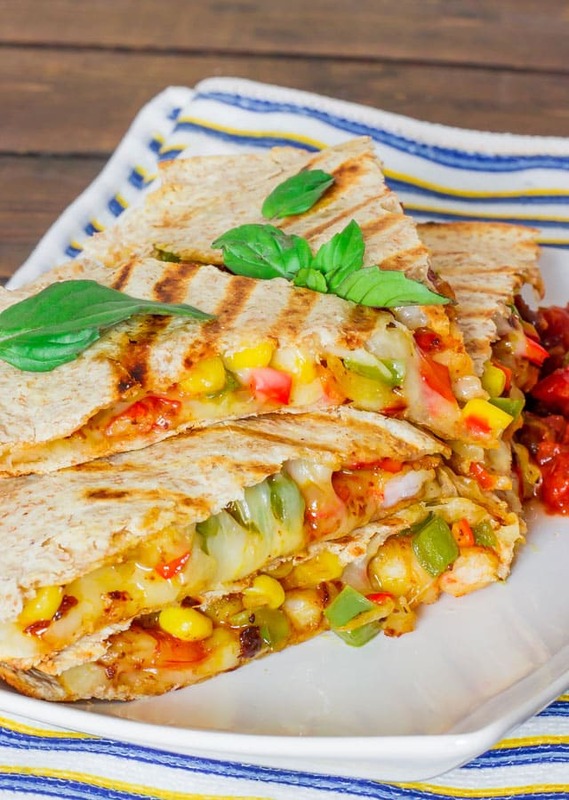 Nothing goes between him and his quesadillas! Well maybe except the dog, but that’s a story for another time. 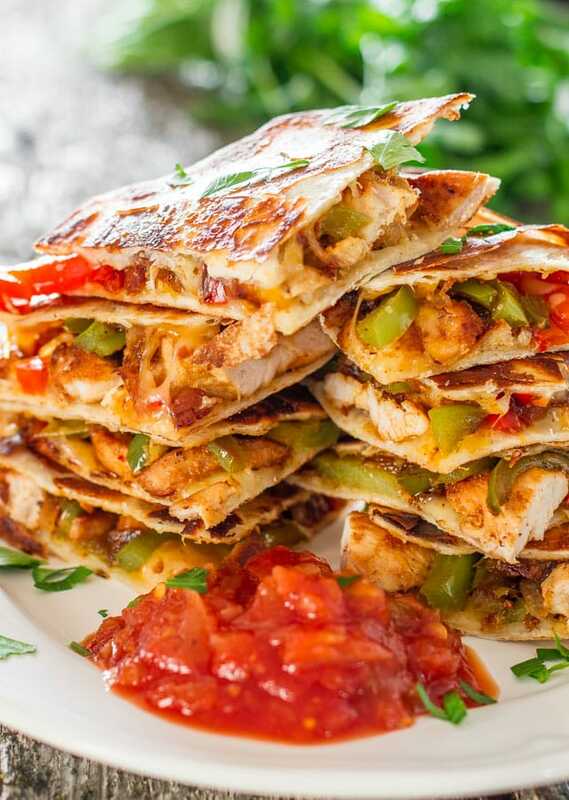 Chicken Fajita Quesadillas - sautéed onions, red and green peppers, perfectly seasoned chicken breast, melted cheese, between two tortillas. Simply yummy. Clean and chop up the onion into long strips. Slice the peppers into long strips. Clean and slice the chicken breasts into long strips and place in a bowl. 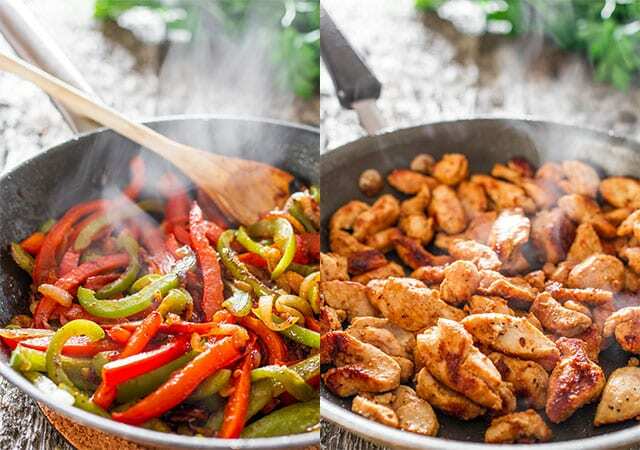 Add a tbsp of the fajita mix to the chicken breast and mix well. In a large skillet, heat 1 tbsp of the olive oil and add the chicken to it. Cook the chicken for 5 to 10 minutes until it's fully cooked and no longer pink, and it's slightly charred, but not burned. 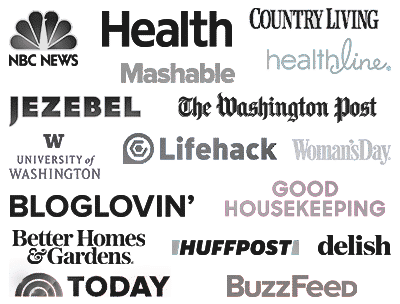 Remove chicken from skillet, and wipe the skillet clean. Add another tbsp of olive oil to the skillet and heat it up. Add the onion and cook for a couple minutes until it's slightly translucent. Add the peppers and the fajita mix and mix well. Cook for a couple more minutes so the peppers cook slightly. Add the chicken to the skillet, mix with peppers and onions and cook for a minute. In a clean skillet, add a bit of the butter and melt. Add a tortilla and move it around until it's buttery. Add a little bit of the chicken and onion mixture on top of the tortilla, and about 1/4 cup of cheese, depending on how you like it. Add another tortilla on top and pat it down. Now flip it over and cook on the other side until the other side is nice and golden. Remove from skillet and cut into quarters. Repeat these steps with the remaining tortillas. 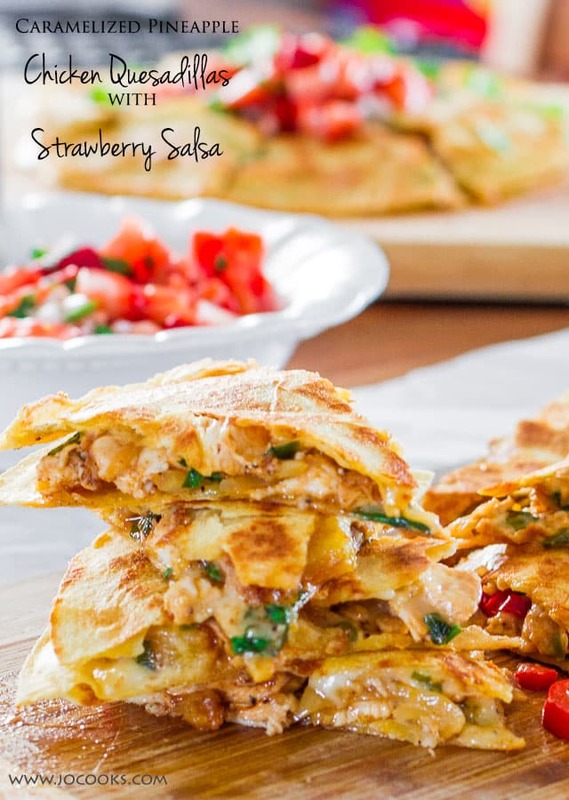 Serve this with some sour cream and salsa. We are having a pot luck lunch at work tomorrow and my coworker who we are celebrating is getting married this weekend and queasadias are her favourite so I am attempting for the first time to make them from your recipe because it looks easiest to follow for a first timer! I’ve always filled the tortillas and thentransported them to the skillet. Duh, this is so much easier. Thanks for the recipe, it was great. Hi! What size burritos did you use? I used medium size tortillas. 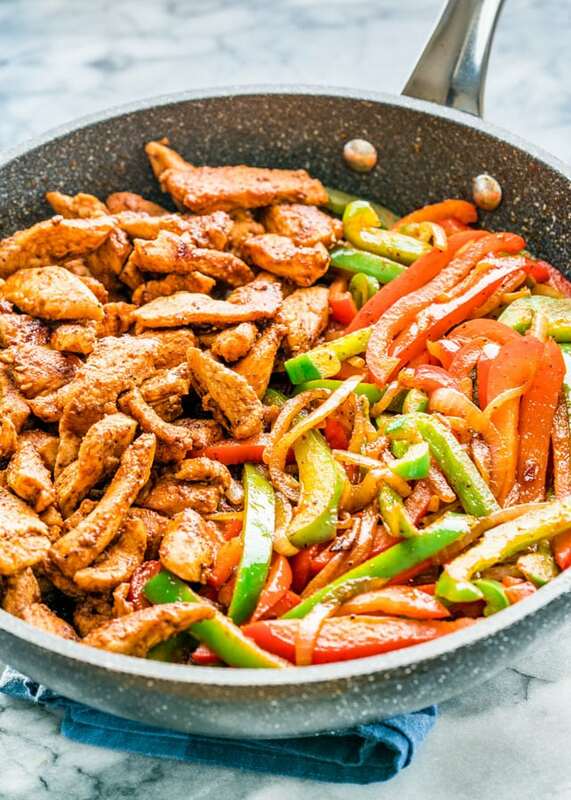 You say to add 2 tbs of fajita mix to chicken breast and then further down recipe it says to add fajita mix to peppers? Do I add twice and if so how much? It says to add 1 Tbls to the Chicken so I think you add the other Tbls to the Vegetables. pls can you tell me the weight of the chicken breasts? Hi Lynn! You need about 1 lb of chicken breast. Is it powdered fajita mix in pkg.? 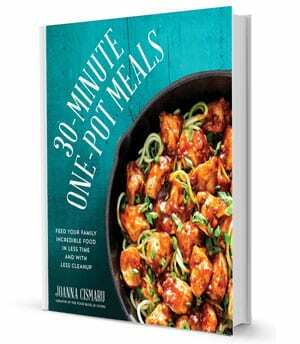 Yes, or you can find the recipe here and make it yourself.